This is a dullard question but only as I am not near my car at the mo. The wheel nuts seem to be quite rusty, the things that I can see on the outside of my wheels. Holding the alloys in. I want to get replacements or covers, am not sure. Anyone notice the state of their wheel nuts though? Any help appreciated. Can anyone point me to a set for all 4 wheels? so i swapped it over, i would go to toyota and order the qty of nuts you need. I can get them on ebay for a lot less and the same quality it seems. Annoying as hell as it is a 15 plate. Might take one off and have a look and see how far the issue is (could be purely cosmetic). I personally think it will happen more so with cheaper ones off eBay as they are only plated metal, and as soon as you put a wheel nut socket on them, it will scratch the coating and let moisture into the metal and rust the surface. You might be better fining some covers, off eBay for the right size bolts which are 17 or 19mm i think. I have to say that I'm with Steve ( @WoldsMotorsportEngineering ) on this one. The bolts on my Aygo Fire were looking a bit scruffy and so I gave then bolt heads a good thrashing with a wire brush, followed by a thin coat of "Kurust" and then a top coat of silver enamel paint. I used a little tin of "Humbrol" silver (The paint we used to use for Airfix kits.....I'm probably showing my age there! ) although if you have a can of silver hammerite knocking about, it'll have the same result. You can't go wrong for £1.19 with free delivery but you do have to wait about 3 weeks for them to arrive from China. 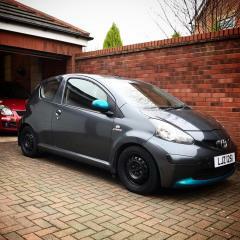 I chose the black to contrast with my silver alloys and they look pretty good, they are also good quality even though the locking nut cover won't fit over my Toyota locking bolts but just remember to take them off before your car goes in for a service as your garage might lose them. Another idea whilst you have the back wheels off is to carefully paint the rear brake drums with some black Hammerite or VHT paint as they can start to look uncared for and let the rest of your car down. It's not really the weather for jobs like this just yet.....But it'll soon be Spring! I can highly recommend putting the bolts in a vinegar & salt concoction to remove rust. I've done this on bolts for my Corolla and it gets rid of the rust really well. Then paint them maybe? Or electrolitically zinc coat them?